I am home again from another camp weekend -- the final camp of the season, actually. If I could only use one word to describe everything, it would probably be, "Wow." The guard joined us to make for a pretty crowded school -- but that was OK, because felt more like a drum corps having everyone around. It was a rainy weekend in New Jersey, but that didn't stop the Cadets. The field was pretty much destroyed from all of the water, so we ended up lining the parking lot with soap so that we could learn drill. Paula Hyman (left) and Sarah Paradis. I? How rude of me. 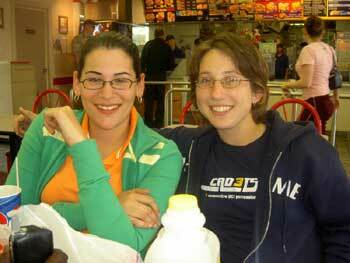 Well, I'd like to take this time to commend our two new captains for the 2005 season -- Kim and Erika. They worked tirelessly weeks before and all during the camp to make sure that everything went perfectly -- and I can say that it was smooth sailing all weekend. Great job girls! The guard is filled with a plethora of young talent this year, along with a lot of incredible returning members. It was nice to have all those enthusiastic, fresh faces around town. Let's see. We played some more in small sectionals after the Hoppy meeting. Since our shoes were soaked, our tech Jana let us wear flip-flops during all of sectionals. Thank you Jana. We played through a lot of music during small sectionals and Jay Bocook even spent some time with us. After a couple of hours the whole brass line got together to work on/run through all of the show music. We were on fire. The volume? Deafening. chocolate chip blast. I had a ton of fun this weekend, just like I do every camp, but I was pretty depressed walking around the airport, I'm not gonna lie. I had about two hours until my flight, so I was just wandering around, looking for Cadets so I didn't have to be bored. I was ready to move in this weekend. I eventually found some of our color guard and a couple of us ended up being on the same flight, which cheered me up. Well, I've got to get going to I can watch the rest of "Jerry Springer" and then head out to work. Shouts out to Rudy, Christen, Craig, Jared and Laura. Thanks for reading! Paula Hyman is a fourth-year member of the Cadets where she is the mellophone section leader. She is 20 years old and currently single. Originally from South Florida, Paula recently made the move to Allentown, Pa., to work for YEA!, the umbrella organization of the Cadets, Crossmen and the U.S. Scholastic Band Association. She ages out in 2006.